On Valentine's Day, the four of us: Cathy, Joe R., Joe A. and Jesse went to the Colorado Wolf and Wildlife Center (CWWC). 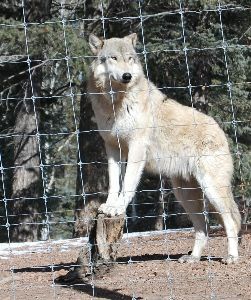 The Center, located about an hour west of Colorado Springs outside of Divide, Colorado, is a sanctuary for rescued wolves, wolf-dogs, foxes and coyotes. These animals have been rescued from various situations around the country ranging from backyards, college dorms, wooden crates, Hollywood, photography farms, hunt farms and fur farms. In order to achieve its Mission to "Educate, Preserve and Protect", the Center offers public tours of the facility plus educational programs at schools throughout Teller, El Paso, Park and Summit Counties in Colorado. The Center has also introduced it's outreach programs into the Denver metropolitan area and to inner city children who would otherwise never have such an opportunity. They generally have from 13-15 wolves onsite and 2 offsite, 2 coyotes and 4 foxes. Each wolf enclosure is roughly an acre in size. Per enclosure, they have only a male/female pair which are neutered/spayed. They currently have some of the largest enclosures per two animals in the United States. The foxes are able to stay together in a family unit - currently four. View our slide shows below to see the pictures we took while on our guided tour of the Red Foxes, Swift Foxes, Arctic Wolves, Mexican Wolves, Red Wolves, and Timber Wolves. A website like http://tripfarenough.com will provide you with the highest quality in the industry. click here for a find a reliable and ROhs manufacturer that will give you the conductive tape you're looking for quickly and easily.